All $55 million at one shot? Spring Training is a fun time. Have had a blast the couple of times that I've gone down there, so this is cool to hear. Now only if more teams were around to play. Under the terms of the new agreement, St. Lucie County will be seeking a $60 million bond, which includes $55 million for new construction and renovations to Tradition Field – the spring training home of the New York Mets and the summer home of the Florida State League St. Lucie Mets. Over the 25-year timeframe of the agreement, St. Lucie County will pay 53 percent; the Mets will be pay 35 percent and the State of Florida will pay 12 percent. This agreement and construction project is contingent on the State of Florida providing a $20 million grant over the next 20 years. The county’s contributions toward the construction will be paid for with portions of the 5-cent hotel tax, which is generated from hotel, RV site and/or condo stays within St. Lucie County for less than six months. “St. 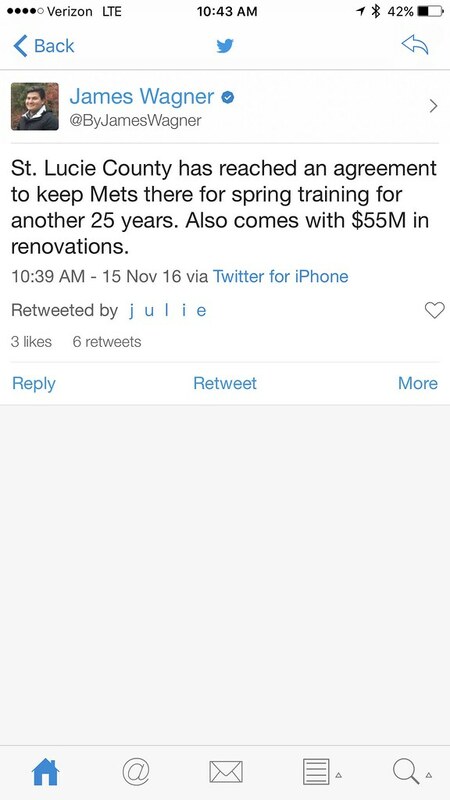 Lucie County has had an excellent working relationship with the Mets since they agreed to come to Port St. Lucie in 1988. And this new agreement only strengthens that partnership to keep them here another 25 years, but also provides some additional exposure for our county to our No. 1 tourism market,” added St. Lucie County Administrator Howard Tipton.